Rachel Wax is a magician and a fashion design student from Chicago. She was originally inspired by her father’s ability to make people laugh and to amaze them simultaneously with magic and she strives to do this with each performance. She started doing magic four years ago and enjoys being able to perform professionally at A Taste of Magic. 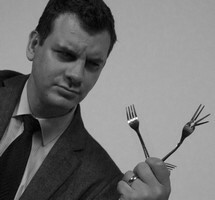 A world-class mentalist and entertainer, Jason is proud to serve as A Taste of Magic’s resident mind reader. His act, a sophisticated blend of psychology and deception, has been featured all over the country. He has read the minds of celebrities, hypnotized CEOs, and lectured on the art of cold-reading for various organizations and universities. Despite being a skeptic at heart, there is nothing that gives Jason greater joy than the thrill of a true and perfect mystery. Noah claims to have traveled here from the year 2048. Please do not email the producers of our show about how implausible time travel is. We are aware that this is ridiculous, but Noah has stuck to this story. Since Noah says he's here to alter the course of history, we call him The Time Stitcher. Known by many as a "Magician's magician", Brandon has made quite a name for himself as a performer, consultant, and magic creator (meaning audiences will see original illusions that aren't done by anyone else in the world). Brandon has quickly become the entertainer of choice for many, including celebrities and major corporations. With his unique blend of magic, mind reading, and charm, he is sure to make every audience instantly fall in love with his skill and personality, then pull the rug out from under their reality, faster than you can say "Amazing!" Originally from upstate NY, Lee Alan Barrett has been performing in and around the NYC area since 1996 Lee is currently a house magician for Ninja NY restaurant, and one of the rotating cast of magicians for A Taste of Magic Show He has taken his comedy/magic act to such venues as the Broadway Comedy Club, The Magic at Coney Show, and LOL Comedy Club. He's appeared on CBS Morning Show, and preformed for organizations such as the Sloan Kettering Cancer Center, Wounded Warriors Project, and Paul Newman’s “The Hole in the Wall Gang” Camp for Kids. Ross "Ta Da" is a regular performer at Taste of Magic, and a crowd favorite. He has performed all over the United States, in Europe, China, and the Pacific Islands - in a variety of different venues. Ross is an active member of several professional organizations, including the Society of American Magicians. With out-of-the box thinking and unique approaches to magical performance Ross has been making events extraordinary for over 10 years. Whether it be a major-museum gala or a small gathering of friends, Ross' goal is to bring the same amount of gravitas to every opportunity. It would be his absolute pleasure to provide magical services for you. Harrison Kramer has delighted audiences around the world with his incredible performances in every possible venue, ranging from large corporate events and glamorous weddings to refugee camps and pediatric ICUs. He is an expert communicator, holding a degree in Rhetoric from Syracuse University and has facilitated over 2000 performances and educational workshops during his career. In 2017 he was elected 2nd VP of The Society of American Magicians Parent Assembly. Oliver Perry Rauch is a 17-year-old magician based in Manhattan, NY. He performs his magic across New York City and is a featured magician for “A Taste of Magic.” Oliver is the former president of the Society of Young American Magicians (NYC), he worked as a magic assistant to the world-renowned magician Ben Nemzer, and has taught the art of magic to students at The Calhoun School. David Corsaro has traveled the world bringing his unique personality and magic to all types of audiences, from the Museum of Natural History to our Armed Forces and their families. He has performed his amazing feats of magic for fortune 500 companies including Wrigley's, Panasonic, Nestle, and Viacom as well as top music acts such as "Chicago," "Earth Wind and Fire," and "The Milwaukees." David also donates his talent for a variety of charitable organizations, such as Habitat for Humanity and Lions International. Award-winning magician Jim Vines specializes in close-up magic, and divides his time between New York City and Long Island's East End. Jim won 1st Place at both major US National Magic Championships of 2016 performing his unique style of Close-Up Magic. His awards include: 1st Place and People’s Choice at the 2016 Gold Cups Championship of the International Brotherhood of Magicians, 1st Place and People’s Choice at the 2016 Society of American Magicians Close-Up Magic Championship, 1st Place at the 2016 Canadian Association of Magicians Close-Up Magic Championship, and the Gold Medal at the 2015 Pacific Coast Association of Magicians Close-Up Magic Championship. He has shared his magic with audiences throughout the United States including the Vegas Wonderground in Las Vegas and the Magic Castle in Hollywood, and over the past year performed in Canada, France, Italy, and Argentina. His original magic effects have been published in the magic industry’s leading magazines. Tobias Dostal is a professional magician and artist from Germany. Since the age of 13, Toby has been surprising his audiences with his comedy and sleight of hand miracles. In 2010 he won the 2nd prize for stage manipulation at the Balkan Magic Convention in Thessaloniki (Greece). Today he is 30 years old and performs regularly at international trade fairs, weddings, restaurants and any kind of celebration. When he's not reading minds and doing card tricks, Mark makes movie magic in the TV and film world. His films have played at festivals including the H. P. Lovecraft Film Festival and Fright Night Film Fest. Mark was magic consultant on the Off-Broadway musical Unlock'd at The Duke Theater, working alongside Callaway Award winning director Marlo Hunter. With an extensive multidisciplinary background including a classical art education, Mark blends his magic and his academic interests, bending perceptions of time and space, foresight and free will. And metal. Lots and lots of metal.